It's pretty clear at this point that the housing market is recovering, albeit slowly. Housing values are ticking up. Sales volumes are increasing. And stock in homebuilders and companies like Home Depot has responded in kind. But in the latter case, at least, it appears investors may have gotten ahead of themselves. 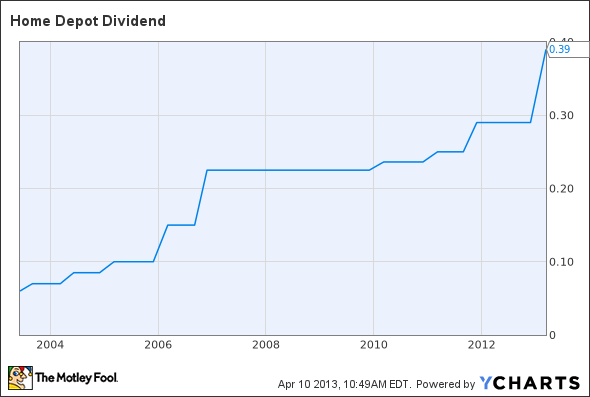 Consider the dividend yield on Home Depot stock. At 2.2%, there's no question that it's generous relative to the 10-year Treasury bond, which is paying a paltry 1.78%. But the same cannot be said when it's compared to more analogous securities. According to The Wall Street Journal, for example, the dividend yield on the Dow Jones Industrial Average is 2.78% -- nearly 60 basis points higher than Home Depot's. Mind you, the yield isn't low because the company hasn't increased the quarterly payout on its common stock. 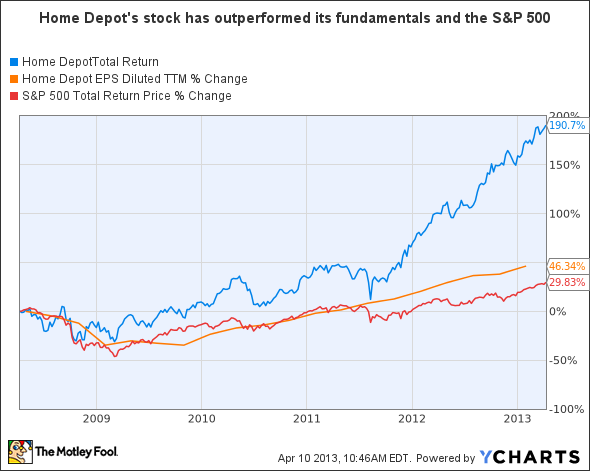 As you can see in the chart above, Home Depot has done so consistently over the past 10 years. Most recently, in February of this year, it hiked the quarterly distribution by an impressive 34%, in addition to announcing a $17 billion repurchase program. Home Depot stock is similarly expensive if measured against the price-to-earnings ratio. Trading at 23.71 times earnings, it's the most expensive it has been in nearly a decade. "Even during 2006 and 2007," Motley Fool blogger Timothy Green notes, "when the company saw rapid revenue growth to $90 billion per year, the stock was trading with the P/E ratio below 15." 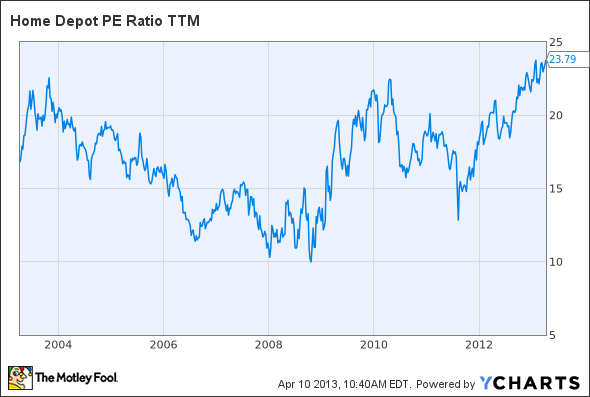 HD P/E Ratio TTM data by YCharts. What explains the dear price? The explanation is simple: As the housing market picks up, investors are increasingly optimistic about any company that benefits from it, and this optimism has outpaced the growth in Home Depot's fundamentals -- particularly the retail giant's earnings (which serve as the denominator in the P/E ratio). HD Total Return Price data by YCharts. The bottom line here is that unless you already own Home Depot stock, you might want to think long and hard before establishing a new long position at its current valuation. The retail space is in the midst of the biggest paradigm shift since mail order took off at the turn of last century. Only the most forward-looking and capable companies will survive, and they'll handsomely reward those investors who understand the landscape. You can read about the "3 Companies Ready to Rule Retail" in The Motley Fool's special report. Uncovering these top picks is free today; just click here to read more. The article Home Depot Stock Has Gotten Ahead of Itself originally appeared on Fool.com.